The architectural firm of Hoppin and Koen mastered the art of turning out European-inspired mansions perfectly adapted for their wealthy American gilded age clientele. Although they employed a classical vocabulary, they were not slavish copyists to the historical styles they emulated. The work in turn could at times appear lighter and more graceful than the ponderous majesty produced by contemporary firms such as Carrere and Hastings. Their mansions were perfect stage sets for the entertainments and country living of the social elite of the day. Examples could be found in all of the fashionable resorts and watering holes of the era, including the following. The Jacobean Charles Cooper residence designed in 1900, still standing in Tuxedo New York. Armsea Hall in Newport Rhode Island, which was leased by John F Kennedy’s administration to serve as his 1964 Summer White House, though the Kennedys never had a chance to occupy it after the tragic events of November 22nd, 1963. Edith Wharton, after having a falling out with Ogden Codman, commissioned the firm to design her Lenox residence, the Mount (with major input from her at every stage of the process). The North Shore of Long Island contained several examples of their work, including the Palladian inspired Rose Mansion (demolished) in Old Westbuury. 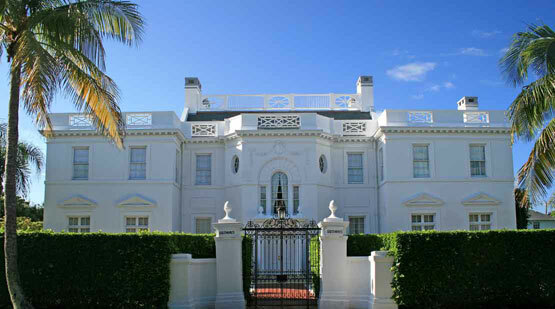 The firm also utilized Palladian motifs for Southways in Palm Beach, built for the Frelinghuysen family in 1920. It is not surprising that the firm was tapped for several notable Hudson Valley Commissions. 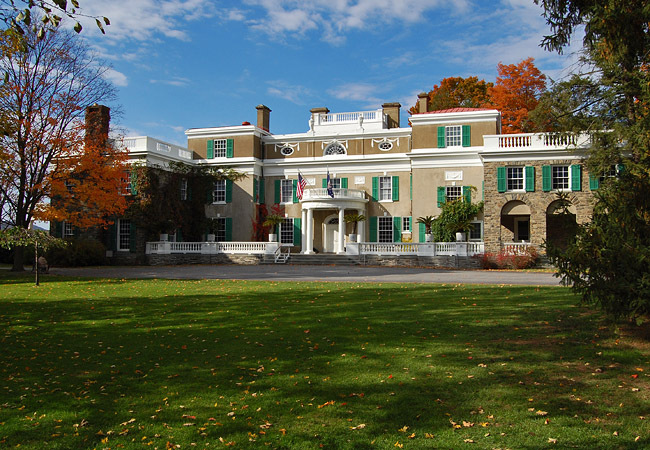 Perhaps the most famous of these is Springwood, the FDR National Historic site in Hyde Park. When Sara Roosevelt sought to transform the comfortable Hudson River Bracketed villa she inherited from her late husband into something more suited to the aspiring policital ambitions of her son, as well as a little more, well “Sara”, she turned to the firm.Springwood pre-renovationSpringwood post-renovation The result was the eclectic, hard to define, yet graceful façade familiar to millions around the world. A little closer to home, I am very fortunate to have two very different surviving examples of their work, both located on the Bard College Campus. The first is Blithewood (currently the Jerome Levy Center for Economics). Built by the firm in 1901 for the Zabriskie family, the forty-two room mansion stands on the site of an earlier house of the same name. Drawing on English antecedents, the symmetrically massed building sports quoins, pilasters, urns, and pediments found in grand country homes from Britain’s Palladian and Georgian eras. The result however, looks every inch the American Country Mansion from the turn of the century. The family donated the estate to Bard college in 1951, who has maintained the mansion in good form. Unlike other architectural firms who might collaborate with famous landscape architects or garden designers on their projects, Hoppin believed firmly that a house and garden should properly be of the same single design. At Blithewood he designed a walled Italian garden as an extension of the house. This may not be immediately apparent when observing this tour de force of garden design today. However, when looking at vintage photographs, long gone shrubs and plantings on the terraces served to closely tie the two elements together. On the northern end of the campus, near the Fisher Center, one can find another example of the firm’s works, the gatehouse at Ward Manor. For this commission the firm again reached back to England’s past, even earlier than the Palladian and Georgian eras. The result is a fairly historically accurate Tudor brick and stone building. Charmingly scaled, I find the house much more aesthetically pleasing than the large “manor house” found at the end of the entrance drive it graces. Both Blithewood and the Ward Manor gatehouse, each very different and appealing in different ways, are a fun exercise in the contrasts and similarities to be found in the firm’s work, and I am happy to have them here in my corner of the Hudson Valley.